Inside, you'll get a cockpit built around the driver to emphasize comfort and intuitive placement of controls that make driving easier. 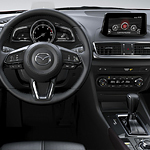 The Mazda3's seats are contoured to fit your body and are available in cloth, leatherette or dual stitched leather. Your ride will be a comfortable one, no matter how long you travel.